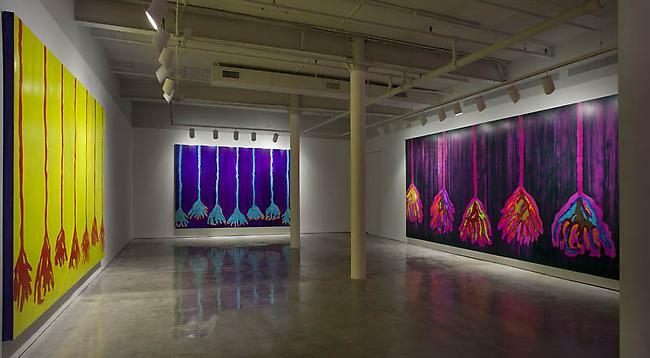 Driscoll Babcock Galleries is pleased to present Drop Dead Gorgeous, the latest body of work by Marylyn Dintenfass, whose brilliant chromatic abstractions evolve to evoke a representational narrative about nature’s fatally duplicitous markers. Dintenfass’ work has always embodied the unease of “nothing is ever what it seems” in life, and her newest canvases draw their inspiration from some of nature’s most beautiful, but dangerous plants. A focus of the show is the Angel Trumpet flower, a ravishing and singular beauty of nature whose exquisite deadliness is iconic. Dintenfass’ vibrant abstractions of the Angel Trumpet’s shapes and forms conjure the plant’s stunning looks, its siren-like allure, and its toxicity. “Dintenfass’ latest work reaffirms her position as a significant figure in the rich tradition of colorists who explore the potent and evocative union of representation and abstraction: figures like James Turrell, Richard Diebenkorn, Mark Rothko, Morris Louis, Paul Klee, Henri Matisse and Paul Gauguin, all of whom she continues to respect,” remarks John Driscoll, President of Driscoll Babcock. Driscoll also pointed to the paintings’ “more overt sexual sensuousness in the metaphorical anatomical references in which the dangerous and sinister flower forms conjure genital appendages and vaginal slits in pulsing colors.” Dintenfass has always loved the interplay of blessings and curses, and in this new series of paintings she has increased the scale, heightened the chromatic intensity and simplified the visual layering to produce a powerful and graphic visual. Critic Lilly Wei has written that Dintenfass’ painting is “[l]ush but also astringent, with a glittered coolness and reserve that offsets its heat…a bracing example of an experiential painting for the present,” In this remarkable group of new large scale paintings, Dintenfass has surely found the duality of the lush and the astringent, the tantalizing and the toxic. As in her previous work, the symbolic layering of intellectual and psychological themes is reinforced by figural layerings of transparent color and the removal of built up surfaces. Drop Dead Gorgeous evokes literal and ephemeral interpretations, reinforced by her method of paint application and removal, where she unites hardedge painting with soft brushstrokes. Her transparent layers of oil paint and the luminescence she achieves from her nuanced mixing of colors and navigating a gestural relationship between light, line, and chroma. Dintenfass’ new large-scale paintings include diptychs and triptychs, amongst single-panel paintings, and as always, metaphors of her own intricate relationship with visual reality and hidden duplicity. Marylyn Dintenfass is an internationally known artist whose work is found in major public, corporate and private collections in Denmark, England, South America, Israel, Italy, Japan and the United States. Among the institutions that have acquired her work are: The Metropolitan Museum of Art, The Cleveland Museum of Art, Detroit Institute of Arts, Museum of Fine Arts, Houston, Mississippi Museum of Art, Minneapolis Institute of Arts and the Smithsonian American Art Museum. Her 2010 Parallel Park installation in Fort Myers, Florida is one of the largest and most noteworthy public art projects of the last decade. A two-time MacDowell Fellow, Dintenfass’ work has been widely reviewed and her 2011 Babcock Galleries exhibition was selected as one of the top 100 shows by Modern Painters.